DynaQuip EHW series Electrically Actuated Light Duty Brass Valves are perfect for open/close, 1/2" through 1 1/4" automated applications which have a low psi media requirement (125 psid CWP or less). From our WaterCop industrial family, these 2 piece forged brass valves are full port with RTFE seats and mount in any position for maximum installation flexibility. Pigtail connections facilitate quick wiring. These NEMA4 light-duty valves have a 25% duty cycle and are suitable for water, oil, gas and other similarly viscous fluids. Valves are NSF/ANSI 372 (specify NSF/ANSI 372 for lead-free) rated for potable water. Choose from multiple options including voltages: 110 VAC, 220 VAC, 12 VDC, 24 VDC; Optional override handles; and feedback options (none, dry contact, live open/close). Requires 115 VAC (on-board pigtail) and a SPDT switch for full open/close. 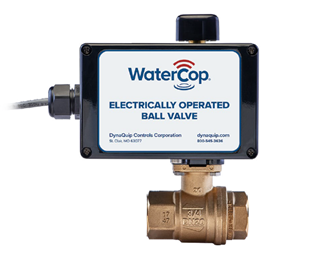 Please note, these EHW series industrial valves require an open/close signal to operate and do not directly communicate with WaterCop wireless sensors and do not have an integrated WaterCop wireless receiver. For whole-house leak detection systems, please see www.watercop.com for information on our WaterCop family of residential shutoff products. Due to the flexibility of available options and exceptionally great value when to compared to other automated valves, these light-duty, direct-mount actuated valves are perfect for specification into a wide variety of OEM applications. Please contact DynaQuip directly for your WaterCop industrial high volume requirements and assistance selecting the proper unit for your application.